I have lost track of the number of pineapples we’ve grilled in the last two months. But that number shot up last week when they were .99 each. Because you know me and how I love to hoard a good produce sale. If you’ve never grilled a pineapple, let me tell you what you’re missing out on. First, a fresh pineapple is so much more flavorful, vibrantly-colored, and crisper than canned pineapple. Give a sweet, yellow round to the grill and you get back a round of caramelized, lightly charred, smokey perfection that you can do anything with. Margaritas. Guacamole. Nachos. Burgers. Tacos. Salsa. This salmon. And even more salmon! Or, you know, slap two rounds on a plate and call it lunch. Or breakfast. No judging here. I had leftovers from one of my very, very favorite ways to prepare salmon (seriously, if you haven’t tried it – do it!) and wrapped it up. Sweet, smokey pineapple. Spicy salmon and weapons-grade jalapenos. Crunchy kale and red onions. A supposed-to-be-cooling-but-not-really-because-that-jalapeno-was-just-way-too-&^%$#@!-hot dollop of Greek yogurt. A healthy, satisfying lunch… or at least it will be when my face stops burning. 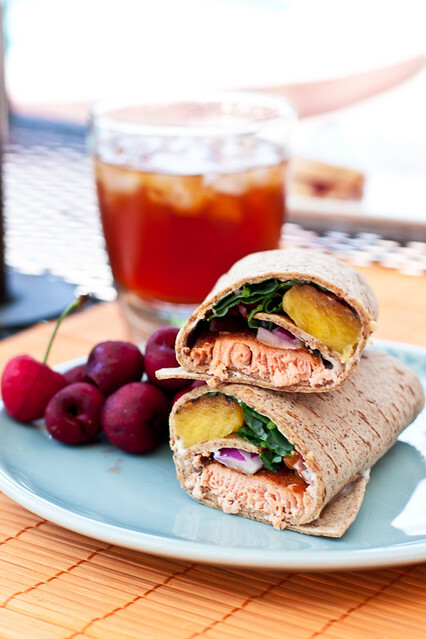 Leftover salmon goes lunch with smokey, grilled pineapple and cool, crunchy veggies. To grill the pineapple, remove the husk, core, and cut into 1/2-inch slices. Grill on med-high for 4-5 minutes each side, until nicely caramelized. 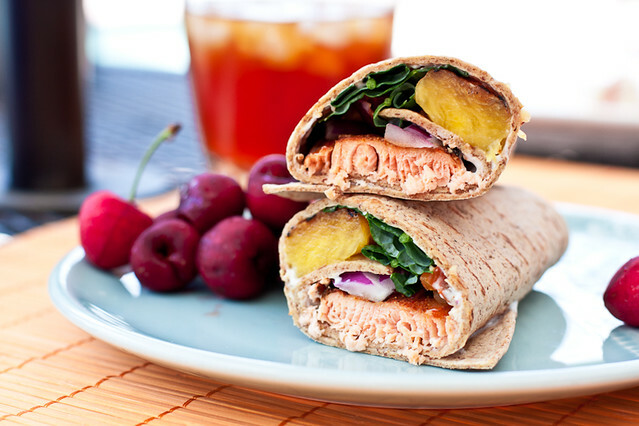 Spread a dollop of Greek yogurt over the wrap. Top with salmon, pineapple, tomato, kale, jalapenos, and red onion. (Optional) Bury face in a snow bank to put out the heat. Um, the flavors in these are so ridiculously awesome, love everything about these!! I miss having a charcoal grill. Hubby haaaaaaad to have a gas grill. Pfft. Now I miss out on all the smokey, woody flavors. Note to self: grill a pineapple this summer. 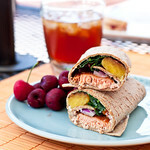 Other note to self: restrain yourself from eating all of aforementioned grilled pineapple and turn it into these wraps!